This article explains how an Admin user can set up and manage a Company account. Refer to this article if you are a Company Account Holder and want to learn how to manage your users. You can use Company accounts to give a customer an access to admin where he can manage his own Account Holders. Company accounts will allow you to set how many Company Accounts (Account Holders) can be created of each of the Service Plans you have on your server. You are also able to set Company-wide limits that will affect all accounts managed by the company account. How do I create a Company Account? As soon as you set the Role to Company, the following fields will appear. All fields will be blank by default. Please note that blank means unlimited, in most cases you will want to put a value into the fields, such as in the example below. Set how many Accounts of this type this Company is allowed to create. For example, in this example, the Company will be allowed to create up to 5 accounts of the type "HI-DEF 100". The Service Plans that appear in this list will be all the Service Plans you have configured on your server. Refer to this article to see how the Company you are creating will be able to manage his accounts. Set the number of simultaneous attendees allowed across all accounts assigned to this company. In this example, the Company-Wide Simultaneous Attendee Limit is set to 100, meaning that only 100 people will be able to connect to all sessions. Since we allowed this Company to create 5 accounts of the account type "HI-DEF 100", and the account type "HI-DEF 100" is configured to allow up to 100 concurrent participants, the theoretical concurrent user limit of this Company would 5 * 100 = 500. However, by setting the Company-Wide Simultaneous Attendee Limit to 100, the total of connected users across all 5 accounts may never exceed 100. If one Account Holder had a meeting with 20 users, and another with 50, and a third with 30 running at the same time, and another user tried to connect to either of the three meetings, then the system would show this user a message leeting him know that the Company Account's Company-Wide Simultaneous Attendee Limit has been reached. 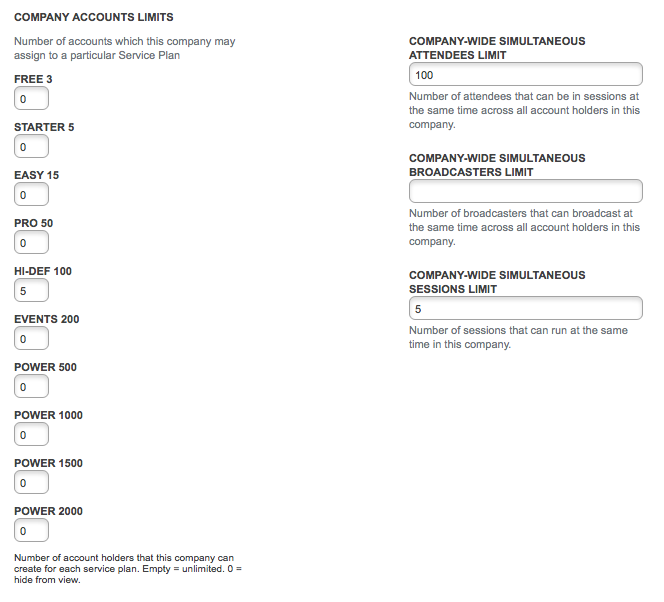 Set the number of simultaneous broadcasters allowed across all accounts assigned to this company. In this example this field is left blank meaning that no limits are imposed, but you could use this field to avoid using too much bandwidth across all accounts. For example, if you wanted to set this to 5, and one Account Holder had a video meeting with 4 users and another Account Holder started a meeting, he would only be able to start one broadcast. If he were to start another he'd get a message saying the Company-Wide Simultaneous Broadcasters Limit has been exceeded. Set the number of simultaneous sessions allowed. In this example it is set to 5, meaning that no more than 5 sessions can be run at any one time across all the Accounts created by this Company. What about the Company Account itself? What limits does it have? Great question. A Company Account, just like any other account, can log in and create and run sessions. The Company Account is the parent account of all of it's account holders. The Company Account is not limited by the limits it imposes onto it's children, so in the example above, if the Company Account were set to be a HI-DEF account, it would be able to run meetings of 100 users without affecting it's child accounts. It would also not be limited in broadcasters. We usually recommend giving the Company Account very strict limits, such as for example a FREE 3 user account. The Company Account itself should typically not be used to run meetings, it should only serve as a parent account to manage user via admin. Can I create and edit Company users and their related user via the API? Yes you can, all the settings described here can be managed via the API. Please refer to the API documentation for further information.